Wisconsin | Western Producer — A couple of years ago, Adam Seibel received US$35 per hundredweight for his organic milk — nearly double the price of regular milk. Then the price fell off a cliff. This year, Seibel is getting about $19 per cwt. 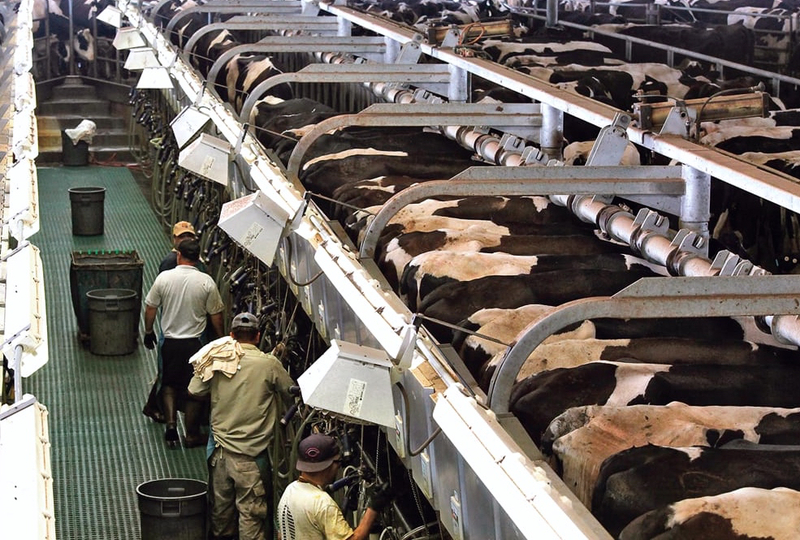 — only a few dollars more than the price paid to conventional dairy farmers in Wisconsin. “The organic demand was there (until)… a lot of big players came into the market,” said Seibel, who milks 130 cows, with his father and brother, near Bloomer, Wisconsin. Seibel’s price, of $19 per cwt, may be low. Other reports suggest that organic milk prices are in the mid-to-high $20 range in Wisconsin, compared to $36 per cwt. a few years ago. Regardless of the exact price, small organic dairies are coping with weaker demand and lower prices across the United States. The Seibels have produced organic milk since 2001 and they’ve invested in two robotic milkers, but it’s still difficult for them to compete with gigantic dairies in places like Colorado, Texas and California. One massive dairy can supply as much milk as 50 to 100 organic farms, which allows a processor or retailer to get all their milk from two or three giant farms. Some of the huge dairies are in midwestern states, such as Indiana, where Fair Oaks Farms is building a huge organic dairy. “Supposedly, they’re coming on with 11,000 cows, sometime soon,” Seibel said. As well, some large organic dairies are in states better known for beef production. In 2016, Wisconsin had 483 organic dairies. In that year, six organic dairies in Texas produced 23 percent more milk than the 483 organic herds in Wisconsin. Seibel and others in the organic sector are frustrated with the massive dairies not just because of their size. He’s convinced that some of the large dairies skirt the organic regulations, particularly the requirement that dairy cows get 30 percent of their dry matter intake from pasture during the grazing season. In 2017, the Washington Post published a story that asked the same question. Journalists from the Post investigated Aurora Organic Dairy, a 15,000 cow operation in Greeley, Colorado, which produces organic milk for the house brands of Walmart, Costco and other retailers. Aurora dismissed the Post survey as inaccurate and a subsequent investigation by the United States Department of Agriculture determined that Aurora was following the rules. Many in the organic sector continue to debate the USDA decision, but there’s no debate that gigantic dairies are causing an oversupply of organic milk. Small producers like Seibel are struggling to find buyers. He has a contract with Saputo to take the majority of his milk, yet no one wants the remainder. “We have no options right now. There is nobody looking to take organic producers,” he said. One possible solution to the oversupply of organic milk is an alternative “organic” market. Seibel said the USDA organic rules are not enforced, therefore, small organic farms need a new standard and the niche market that comes with that standard.